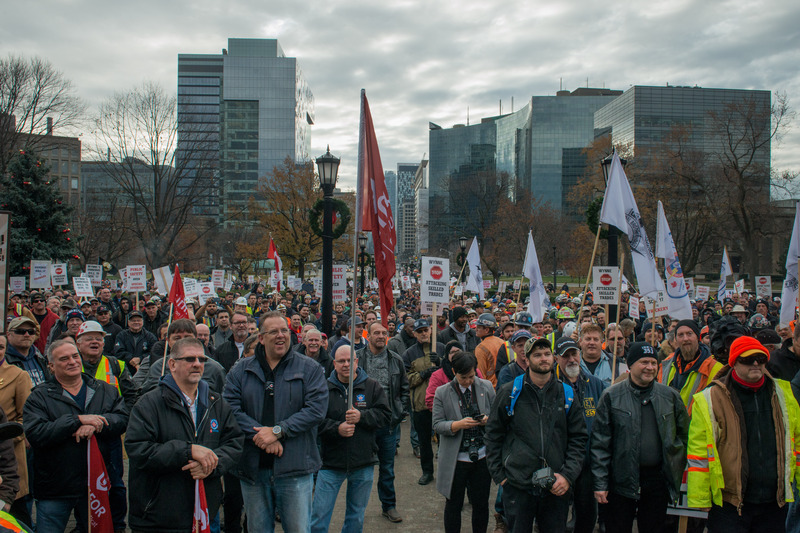 More than 4,000 certified electricians and other certified trades people from across Ontario marched on the front lawn of Queen’s Park on Nov. 30 to voice their strong opposition to Schedule 17 of Bill 70. Several speakers, including ECAO Board President Dan Lancia, gave passionate speeches imploring the government to remove Schedule 17 from the Omnibus Bill which could essentially dilute the enforcement powers of the Ontario College of Trades and greatly devalue a Certificate of Qualification and the compulsory trades designation. The message was loud and clear; Schedule 17 should be removed from the Bill and given proper consultation, review and debate. Visit ecao.org and click on “Let Your MPP Know What you Think About Bill 70” to access a template letter and a list of MPP’s and their ridings. You can voice your concern over Bill 70 and particularly Schedule 17 by signing an on-line petition at change.org. You can also share the petition with colleagues, friends and family. Currently, more than 15,000 people have signed their name in opposition to this Bill. Help reach the goal of 25,000 signatures by signing your name today. The Council of Ontario Construction Associations’ (COCA) Lien Act Task Force went through the Construction Lien Act Review, written by Bruce Reynolds and Sharon Vogel, line-by-line looking for any gaps or unintended consequences. They subsequently have drafted another submission, their third, which will be reviewed by COCA’s Board at their next meeting. It’s anticipated that legislative framework around this issue will be presented to cabinet in early 2017 for approval with a Bill coming forward to the Legislature in the spring session. ECAO is a member of COCA and serves on the Board and Executive Committee. 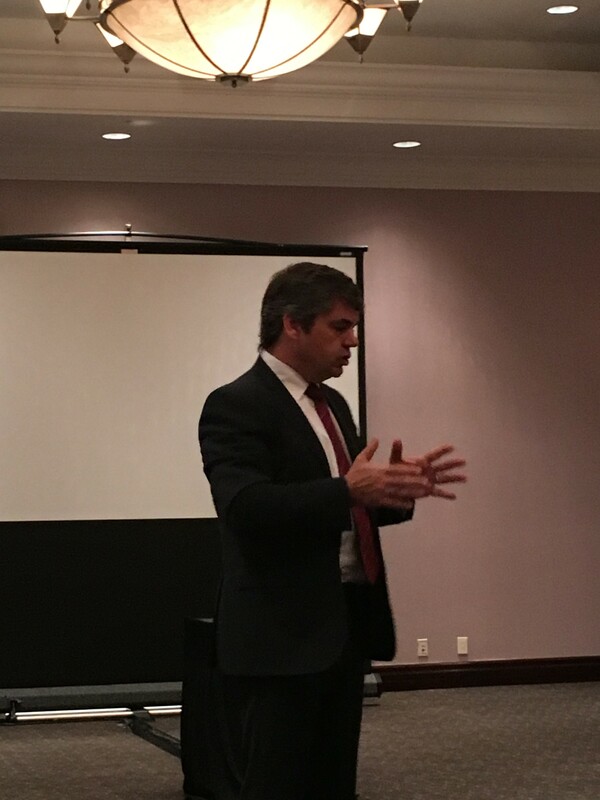 ECAO was pleased to welcome construction legal expert Glenn Ackerley of WeirFoulds LLP on Dec. 1 to provide an insider’s guide to the Construction Lien Act Review. Glenn provided a thorough yet clear outline of the review and what it means for ECAO members and the industry as a whole. As a member of the expert advisory panel that the authors of the report consulted with, Glenn provides a unique perspective. Glenn’s presentation looked at both the potential legal ramifications as well as going through the key recommendations. A question and answer period followed the presentation which gave participants the opportunity to ask specific questions about the report. 2017 ECAO Industry Conference: Registration is on-line and open! Visit http://ecaomunich2017.ca/ to register for our 2017 conference in Munich, Germany. Registration fee includes hotel accommodation and conference registration, which pays for the business sessions, speakers’ fees, and some of the entertainment and meals. The website provides a complete itinerary of what’s included in the registration fee, plus optional events for extra cost and which will be updated depending on interest. Attendees will be responsible for booking their own flights, however the website does provide a discount promotional code for those booking on Air Canada, plus a contact for those wishing to extend their stay or visit other destinations after the conference ends. An exceptional program is being planned including improved business and networking sessions as well as a chance to explore Munich’s extraordinary Bavarian hospitality and culture. If you plan on attending what promises to be an extraordinary conference in Munich, Germany, May 21-27, 2017, you now have the convenient option to pay on-line as you register. Don’t miss out. Visit ecaomunich2017.ca to register now! ECAO has numerous partnership opportunities available for the 2017 Annual Conference in Munich, Germany tailored to meet any marketing budget. Your support will provide you with quality time in front of our members to share your message and highlight your products. Check out the wide ranging options in the sponsorship package now available on-line. Consultations are currently open on proposed changes to the Ontario Building Code. New proposals include: Requiring all new homes and townhomes with garages to be constructed with a 50-amp, 240-volt receptacle in the garage for the purpose of charging an electric vehicle and requiring that all newly-built commercial office buildings and workplaces provide electric vehicle charging infrastructure. If you would like to provide feedback, simply review the materials in the Overview Summary and the Technical Code Change Proposals that are of interest to you and provide feedback on a proposed change by completing and submitting the comment form found online, or by mail. Questions about the consultation process, collection of information and access to the consultation document may be directed to buildingcode.consultation@ontario.ca. All other feedback on the content of the proposed Building Code changes should be included in the comment form. Feedback must be received by no later than Dec. 20, 2016. IHSA is looking for individuals to join their Safety Groups which is a program administered by the Workplace Safety and Insurance Board (WSIB). Safety Group is a forum for companies to share best safety practices, pool their experience, and help one another with their prevention programs. Each member firm works to achieve specific objectives and improve safety performance. IHSA's Safety Groups will be accepting applications until Dec. 31, 2016. To learn more, visit their dedicated Safety Groups web page.